If you are a decision maker around Crowdsourcing, co-creation or open innovation then Crowdsourcing week happening at Singapore between 3-7 Jun would be a very relevant event to attend. Agenda includes extensive line-up of expert sessions on various topics around Crowdsourcing for design, How to get results from crowd, Social innovation, Academia industry collaboration and many more. There is also a Crowdfunding workshop on the last day giving a deep focus opportunity to study and benefit from this new concept. I am sure you would be able to learn from the vast spread of latest trends in Crowdsourcing by attending this event (see list of speakers here). Below I point out some of the key principals (and food for thought) of Crowdsourcing as a curtain raiser to this gala event. Purpose of Crowdsourcing = Does your purpose for Crowdsourcing have one of the following? Open innovation – You know what you don’t know and now you want someone to help you with solving your known problem. Co-creation – You are simply after creating an additional delight factor for your customers using untapped knowhow of the crowd. Crowdsourcing – You kind of know what you want but instead of going to a traditional vendor for it you would go to a place where you can get diversity, speed, reduced cost and most importantly creative options. Infrastructure to enable your Crowdsourcing = People, mindset, IT and social enablers which can sustain your Crowdsourcing ambition. People with open mindset would most probably sit at the top of the list of enablers for success in Crowdsourcing; reason being - it is very easy to script a failure, either by creating milestones and expectations which are not realistic or by rejecting the outcome of Crowdsourcing. The slow and steady rise of Crowdsourcing can be single-handedly attributed to the folks who believed in it and spread the word about their success stories. Connectivity is at the core of Crowdsourcing, so the social strategy and online IT infrastructure (own or hired) would play a decisive role as well. 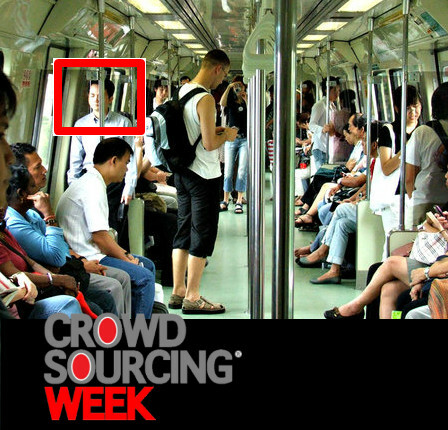 Managing the crowd = Meeting the business goals using Crowdsourcing. If you play the above two cards well, you might end up getting more than a plateful of ideas, solutions or desired options for your Crowdsourcing campaign. It would be of prime importance to manage the contributors by finding a right balance between acknowledging only the contributions which really add value to your organization and at the same time not downgrade the rest of the contribution; after all, in all probability those may have read? merit albeit in different context or for a different situation. Challenge of managing the crowd and their inputs, as they say, is a good problem to have! ideaken is proud to be a sponsor for Crowdsourcing week, If you happen to be at the event then we would love to catch up with you in person. Do write to us here.